Railway jobs, Excellent chance, Railway Recruitment Board(RRB) has broadcasted an advertisement of Railway Ticket Collector Recruitment for filling up 60000 Bharti of Ticket Collector/Guard & Others. Eligible job fighters may apply for Railway Ticket Collector jobs by filling the application form with all important details. 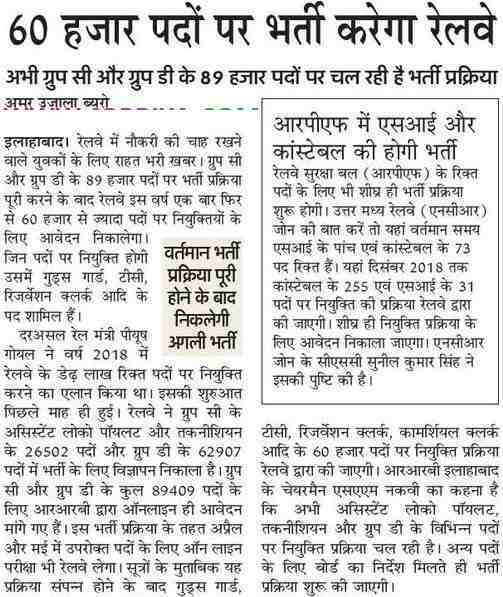 Railway Recruitment Board is going to appoint talented and self-motivated candidates to fill vacant sixty thousand job openings. Apply through online mode. Closing Date to apply is given below. Before applying for Railway Ticket Collector vacancy candidates must check the eligibility norms given below. 12th / Graduate Degree with 50% marks in aggregate from government recognized Board or institution or University. Relaxation in age will be given to reserved category as per norms. Earn good amount of Pay Scale of Rs 5200-20200 + Grade Pay Rs 1900. Submit an amount of Rs. 100/- as application fee. Application Fee Can Be Paid Online through Debit Card / Credit Card or Net Banking. SC/ST/Ex-s/women need not to pay an application Fee. Selection will be done on basis of their performance in Written Exam, Psycho Test, Physical Efficiency Test (PET), Document Verification and Medical Test. Final selection will be done through Personal Interview. Psycho Test is the 2nd stage of examination. Applicants who have qualified in the both stages of exam will be called for PET in 1:3 ratios. Male candidates should be able to run for a distance of 1000 meters in 4 minutes 15 seconds in one chance. Female candidates should be able to run for a distance of 400 meters in 3 minutes. Applicants who have qualified in (PET) they will be called for verification of original certificates. Contenders need to fill the RRB Ticket Collector Application Form through the official site that is www.indianrailways.gov.in. Hit the link to RRB TC Recruitment Apply Online. On next page choose the suitable link from RRB Regions / Zone”. Particular region site will be displayed. Choose appropriate link to fill RRB TC Application Form. RRB TC Online Form will appear on your computer screen. Fill an Online Application Form with all essential details and upload photograph and signature. At the end take print out of form.